Who doesn’t wonder about a long-lost love? Especially when life has got you down, and you’re wondering where and how your life took such a wrong turn. . . .
You pull out some old love letters, and you wonder: will they make me cringe, or was he really the dreamboat I thought he was? And then. . . because we can, we Google him. This is how Samantha Vérant‘s incredibly romantic Seven Letters from Paris (Sourcebooks, October 2014) begins. Five years later, and Samantha is married (after a fairytale wedding in California) and living with her adorable Jean-Luc and his two children in southern France. She’s still stumbling over her French conjugations (who isn’t?) and coming into her own as a writer, wife and stepmom. It’s tailor-made for a romantic comedy starring, oh, who knows, Reese Witherspoon? Julia Roberts? Just saying. Samantha and I had big plans to meet up in southern France in September. I was eager to meet somebody who felt like my younger, crazier little sister. After all, I felt like I knew her after I just finished her memoir. I even stole some slippers from my hotel to give her and Jean-Luc as a belated wedding gift! But toward the end of an entire month in France, you can lose track of what day it is (hmmm, too many wine tastings?). Samantha and I missed our planned connection in Montauban, but that didn’t stop us from sharing a happy hour together on Google Hang-Out after I trained back to Paris. I had a good bottle of Bordeaux to finish before I had to return to Chicago, but thanks to Samantha, I didn’t have to drink alone! I’m here to tell you that Samantha is the real deal. She’s funny and honest and brave, just like in the book. She’d be a great author for your book club to Skype with, if you can figure out the time difference! I’m happily married, but what the heck. Maybe even I’ll start Googling. . . . 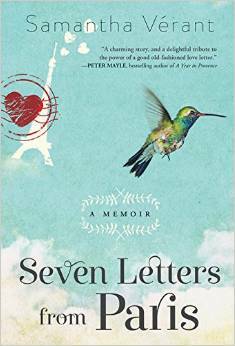 This entry was posted in Book Review, Paris Books and tagged Samantha Vérant, Seven Letters from Paris, Sourcebooks by americangirlsartclubinparis. Bookmark the permalink. What happens on Google sometimes doesn’t always stay on Google! 🙂 Thank you so much for your support, Margie! The next time your in France or when I’m in Chicago (hope to get back soon) we’ll have to connect!!! !